As I was watering some of the plants in the backyard tonight, there was a bird (a mockingbird I think) flying around me, harassing me. It was quite annoying and I couldn't figure out why she was being so bold until I got to the hibiscus. Too cute. I went inside and watched and sure enough she was bringing the baby food, so I hope everything works out well. I know the boys will want to watch it grow. If the parent has white stripes on the end of both wings, that's the sure clue to being a mockingbird (look in the bird book!). The mamma quit coming back, and with the storm last night I broke down and put the baby in the garage. A friend told me that I can take it to the SPCA and someone there will take care of it and release it. Good. The feeding doesn't have to be constant. I'm surprised there is just one baby. 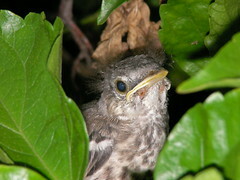 The baby will just get bigger and more anxious for a bite of bug, and then after a few weeks, with a short flying lesson, it should be gone.